Erythromycin A (Er-A) produced by the actinomycete Saccharopolyspora erythraea is an important antibiotic extensively used in human medicine. Dissecting of transcriptional regulators and their target genes associated with erythromycin biosynthesis is crucial to obtain erythromycin overproducer strains through engineering of relevant regulatory elements in S. erythraea. Here, we identified a TetR family transcriptional regulator (TFR), SACE_5754, negatively controlling erythromycin production. 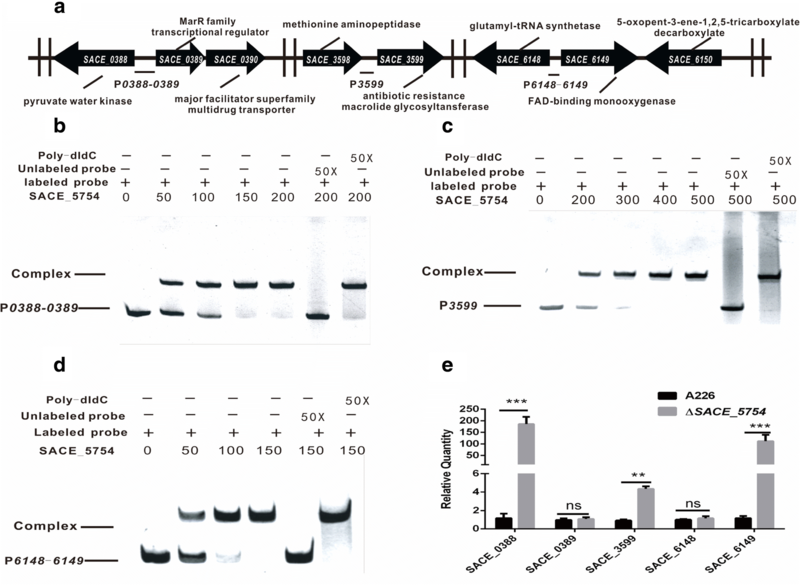 SACE_5754 indirectly repressed the transcription of ery cluster and cannot regulate itself and its adjacent gene SACE_5753. RNA-seq coupled with EMSAs and qRT-PCR was performed to identify the targets of SACE_5754, and confirmed that transcription of SACE_0388 (encoding a pyruvate, water diknase), SACE_3599 (encoding an antibiotic resistance macrolide glycosyltransferase) and SACE_6149 (encoding a FAD-binding monooxygenase) were directly repressed by SACE_5754. A consensus palindromic sequence TYMAGG-n2/n4/n11-KKTKRA (Y: C/T, M: A/C, K: T/G, R: A/G) was proved to be essential for SACE_5754 binding using DNase I footprinting and EMSAs. During the three target genes of SACE_5754, SACE_0388 and SACE_6149 exhibited the positive effect on erythromycin production. Overexpression of either SACE_0388 or SACE_6149 in ∆SACE_5754 further increased the Er-A production. By engineering the industrial strain S. erythraea WB with deletion of SACE_5754 combined with overexpression of either SACE_0388 or SACE_6149, Er-A production in WB∆SACE_5754/pIB139–0388 and WB∆SACE_5754/pIB139–6149 was successively increased by 42 and 30% compared to WB. Co-overexpression of SACE_0388 and SACE_6149 in WB∆SACE_5754 resulted in enhanced Er-A production by 64% relative to WB. In a 5-L fermenter, WB∆SACE_5754/pIB139–0388-6149 produced 4998 mg/L Er-A, a 48% increase over WB. We have identified a TFR, SACE_5754, as a negative regulator of erythromycin biosynthesis, and engineering of SACE_5754 and its target genes, SACE_0388 and SACE_6149, resulted in enhanced erythromycin production in both wild-type and industrial S. erythraea strains. The strategy demonstrated here may be valuable to facilitate the manipulation of transcriptional regulators and their targets for production improvement of antibiotics in industrial actinomycetes. Erythromycin A (Er-A) is widely used in clinic against pathogenic Gram-positive bacteria, industrially produced by the actinomycete Saccharopolyspora erythraea . As a model of polyketide biosynthesis, erythromycin biosynthesis has been investigated by genetic and biochemical assays for production improvement and structure diversification . At first, two primary metabolic precursors, propionyl-CoA and (2S)-methylmalonyl-CoA units, are enzymatically catalyzed by multifunctional modular PKS to form 6-deoxyerythronolide B (6-dEB) . Next, a series of tailoring reactions including hydroxylation, glycosylation, and methylation take place to produce the final product Er-A. Erythromycin biosynthetic gene cluster (ery cluster) in S. erythraea contains 20 genes arranged in four major polycistronic units , but lacks regulatory genes, hampering efforts to improve erythromycin production by engineering relevant regulatory elements. Traditionally, optimization of medium composition, random mutagenesis and selection have been performed to enhance erythromycin production . Nowadays, rational engineering of the metabolic and regulatory pathways involved in biosynthesis of erythromycin was also an effective way to increase erythromycin production [6, 7]. Since the advent of “Omics” era, the genome-based functional investigations of antibiotic producers shed new lights on systematical understanding of molecular regulation of antibiotic biosynthesis . Especially, transcriptome-driven reverse engineering strategy have been utilized for identifying and manipulating regulatory genes for production improvement of polyketide antibiotics . However, few studies were reported on transcriptome-based target identification of transcriptional regulator associated with antibiotic biosynthesis in actinomycete. The TetR family transcriptional regulators (TFRs), a class of regulators commonly found in bacteria, participated in diverse cellular processes . In recent years, a variety of TFRs, inside or outside the gene cluster of antibiotic biosynthesis in actinomycete, were identified to regulate the biosynthesis of antibiotics by binding to the promoter region of their target genes [11–14]. Based on our previous prediction , 97 putative TFRs were encoded in the genome of S. erythraea, in which SACE_3986, SACE_7301, SACE_3446 and PccD (SACE_3396) were successively proved to regulate erythromycin biosynthesis [12, 15–17]. Nevertheless, additional TFRs associated with erythromycin production in S. erythraea need to be further identified to improve the understanding of regulatory mechanism underlying erythromycin biosynthesis. Here, we identified a novel TFR, SACE_5754, indirectly repressing the erythromycin biosynthesis. 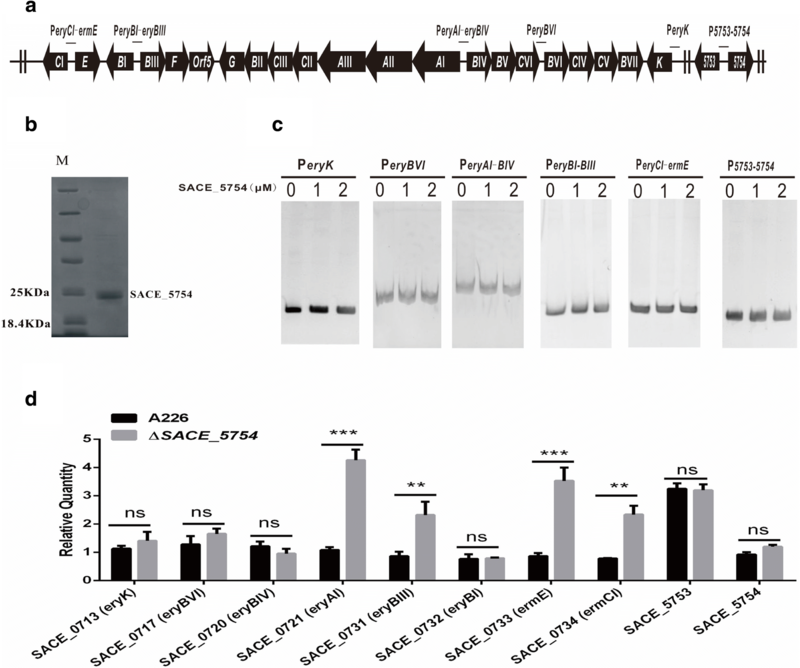 SACE_5754 cannot regulate itself and its adjacent gene, increasing the difficulty to study its targets to understand the molecular mechanism of SACE_5754 for regulating erythromycin biosynthesis. Thereby, this study utilized RNA-seq based transcriptome analysis coupled with qRT-PCR, EMSAs and genetic experiments to identify and characterize SACE_5754’s targets related to erythromycin production. Further engineering SACE_5754 and its target genes significantly increased erythromycin production in both wild-type and industrial S. erythraea strains. Considering the key role of TFRs in antibiotic biosynthesis in actinomycetes, we performed gene inactivation and identified several TFRs involved in erythromycin production in S. erythraea. These contained three TFRs (SACE_3986, SACE_7301 and SACE_3446) previously published and SACE_5754 currently investigated. SACE_5754 contains 624 nucleotides with approximately 22 kDa molecular mass. The location of SACE_5754 and its adjacent genes on the chromosome were shown in Fig. 1a. Blast analysis revealed that SACE_5754 homologs are widely distributed among actinomycetes, suggesting that this TFR may have important biological functions in actinomycetes (Additional file 1: Figure S1a). SACE_5754 was disrupted with a tsr replacement in S. erythraea A226, generating the ∆SACE_5754 mutant (Fig. 1b and c). Er-A production in ∆SACE_5754 (64 mg/L) was 41% higher than that in strain A226 (45 mg/L). The complemented strain ∆SACE_5754/pIB139–5754 restored the original erythromycin level, suggesting that production enhancement of erythromycin in ∆SACE_5754 was solely due to the SACE_5754 disruption (Fig. 1d). Furthermore, pIB139–5754 and pIB139 was individually introduced into strain A226. The SACE_5754-overexpressed strain A226/pIB139–5754 (31 mg/L) successively exhibited 31 and 28% reduction in Er-A production relative to A226 and A226/ pIB139 (43 mg/L) (Fig. 1d). Deletion and overexpression of SACE_5754 in strain A226 had no effect on cell growth and sporulation, inferring that SACE_5754 was not involved in cell growth or morphological differentiation of S. erythraea (Additional file 1: Figure S1b and 1c). To prove the possibility that SACE_5754 regulates erythromycin production through ery cluster (Fig. 2a), we measured transcripts of ery cluster by qRT-PCR. Results showed that the transcriptional levels of eryAI (SACE_0721, encoding polyketide synthase I), eryBIII (SACE_0731, encoding NDP-4-keto-2, 6-dideoxyhexose 3-C-methyltransferase), ermE (SACE_0733, encoding rRNA methyltransferase) and eryCI (SACE_0734, encoding transaminase) were respectively increased by 4-, 2.7-, 4- and 3- folds compared with A226 (Fig. 2d), indicating SACE_5754 might negatively regulate erythromycin biosynthesis. To examine whether SACE_5754 might directly regulate transcription of ery cluster, it was expressed in E. coil BL21 (DE3), and was used to examine its affinity to the five regions containing ery promoters with EMSAs (Fig. 2b). Results showed that SACE_5754 did not bind to ery promoters (Fig. 2c), demonstrating that SACE_5754 may regulate erythromycin production by indirectly repressing the expression of ery cluster. Most TFRs are transcriptional regulators to regulate their adjacent genes and/or themselves . 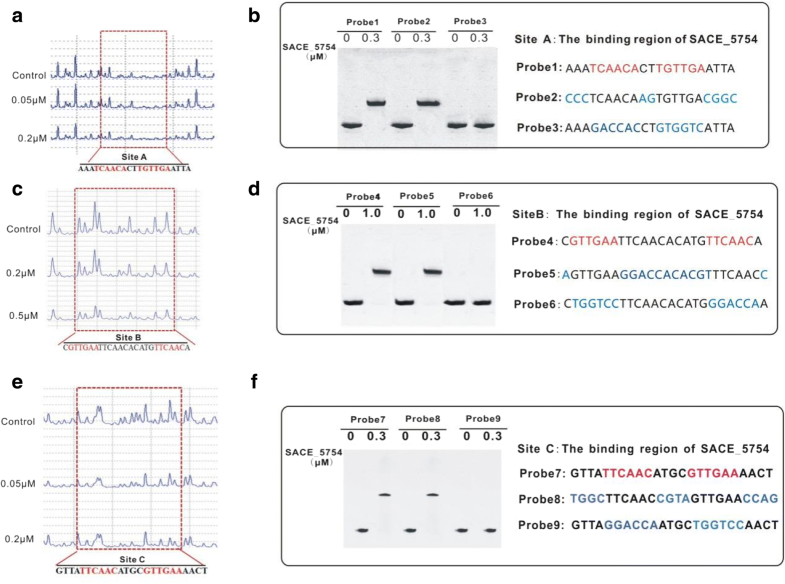 To investigate whether SACE_5754 directly binds to its adjacent gene SACE_5753 and to its own promoter regions, His6-SACE_5754 was used to perform EMSAs with DNA fragment P5753–5754, which covers the entire promoter regions of SACE_5753 and SACE_5754, but no obvious gel shift band was detected. Furthermore, we measured transcripts of SACE_5754 and SACE_5753 by qRT-PCR, and found that the transcriptional levels of SACE_5754 and SACE_5753 had no change in A226 and ∆SACE_5754, suggesting that SACE_5754 cannot regulate its own gene and adjacent gene SACE_5753 (Fig. 2d). In order to search for SACE_5754’s targets, transcriptomic comparison between A226 and ∆SACE_5754 was performed by RNA-seq. With the statistic criteria of Foldchange ≥2 and probability ≥0.8, a total of 623 differential expressed genes were identified (440 up-regulated genes and 183 down-regulated genes) in ∆SACE_5754. Herein, promoter regions of 80 genes with a greater than 0.9 probability in the transcriptomic data were tested by EMSAs (Additional file 1: Table S3), and results showed that SACE_5754 could specifically bind to P0388–0389、P3599 and P6148–6149 (Fig. 3a, b and c). Further qRT-PCR analysis found that SACE_0389 and SACE_6148 were not affected by SACE_5754 deletion, but the transcriptional levels of SACE_0388, SACE_3599 and SACE_6149 were increased by 158-, 4.7- and 95- folds, respectively (Fig. 3d). It seemed that SACE_5754 directly represses the transcription of SACE_0388, SACE_3599 and SACE_6149. In order to precisely determine SACE_5754’s binding site within the intergenic region of SACE_0388 and SACE_0389, a DNase I footprinting experiment was performed, and a 12-bp palindromic sequence AAATCAACACTTGTTGAATTA (termed site A) in P0388–0389 was protected by SACE_5754 (Fig. 4a). To assess the importance of the palindromic sequence for SACE_5754 binding, EMSAs were performed with different probes, named probe 1 (no mutation of site A), probe 2 (with base substitution without the palindromic sequence of site A) and probe 3 (with base substitution within the palindromic sequence of site A) (Fig. 4b). As expected, probe 2 showed the same band shift as probe 1, while probe 3 showed no binding (Fig. 4b), demonstrating that TCAACA-n2-TGTTGA was indispensable for SACE_5754 binding. DNase I footprinting experiments showed that P3599 and P6148–6149 also had 12-bp palindromic sequences protected by SACE_5754, CGTTGAATTCAACACATG TTCAACA (termed site B) and GTTATTCAACATGCGTTGAAAACT (termed site C), respectively (Fig. 4c and e). EMSAs with base substitution mutagenesis showed that the 12-bp palindromic sequences were indispensable for SACE_5754 binding (Fig. 4d and f). Those findings indicated that the palindromic sequence TYMAGG-n2/n4/n11-KKTKRA (Y: C/T, M: A/C, K: T/G, R: A/G) was essential for SACE_5754 binding. In order to explore the relationship of SACE_0388, SACE_3599 and SACE_6149, SACE_5754’s targets, to erythromycin biosynthesis, the ∆SACE_0388, ∆SACE_3599 and ∆SACE_6149 mutants were individually constructed (Additional file 1: Figure S2-S4). Compared with A226, ∆SACE_0388 and ∆SACE_6149 respectively produced lower Er-A by 80 and 60% (Fig. 5a and b); however, ∆SACE_3599 showed no yield change (Fig. 5c). Overexpression of SACE_0388 and SACE_6149 in A226 improved Er-A production by 32 and 28% (Fig. 5a and b). Those findings indicated that SACE_0388 and SACE_6149 had the positive effect on erythromycin production, while SACE_3599 did not affect erythromycin production. Furthermore, to investigate whether overexpression of SACE_0388 and SACE_6149 in ∆SACE_5754 would further affect Er-A production, pIB139–0388 and pIB139–6149 was introduced into ∆SACE_5754 to obtain ∆SACE_5754/ pIB139–0388 and ∆SACE_5754/pIB139–6149, respectively. Compared with ∆SACE_5754, ∆SACE_5754/ pIB139–0388 and ∆SACE_5754/pIB139–6149 had 83 and 50% increase in the Er-A production, respectively (Fig. 6a). To evaluate the possible improvement of erythromycin production in industrial settings, SACE_5754 and its target genes SACE_0388 and SACE_6149 were engineered in a high-yield industrial S. erythraea WB. Firstly, when SACE_5754 was deleted in WB, the obtained WB∆SACE_5754 exhibited production improvement of Er-A by 19% (Fig. 6b). Secondly, either pIB139–0388 or pIB139–6149 was introduced into WB∆SACE_5754. Compared with WB, the resulted WB∆SACE_5754/pIB139–0388 and WB∆SACE_5754/pIB139–6149 improved Er-A production by 42 and 30%, respectively (Fig. 6b). Lastly, co-expression of SACE_0388 and SACE_6149 in WB∆SACE_5754 led to a 64% increase in Er-A production compared to WB (Fig. 6b). Considering further application of the engineered strain in industry, we cultured WB∆SACE_5754/pIB139–0388-6149 in a 5-L fermenter for time course analysis of erythromycin production. The production of Er-A was increased by 48% from 3327 mg/L in WB to 4998 mg/L in WB∆SACE_5754/pIB139–0388-6149 (Fig. 6c). TFRs can be grouped into three types based on their orientation relative to neighboring genes in the genome, which can be used to predict the target genes of TFRs . Type I TFR is divergently oriented to a neighboring transcription unit, as is the case for tetR and tetA, where the intergenic region between the two genes is less than 200 bp . The majority of TFR genes are type I TFRs, which are generally auto-regulatory and also control the expression of adjacent genes . The present work has characterized a novel TFR, SACE_5754, which negatively controls erythromycin biosynthesis in S. erythraea. However, SACE_5754, a type I TFR, cannot regulate itself and SACE_5753, and also didn’t bind to promoter regions of ery cluster, hampering the effort to identify its targets for mechanistic dissection of SACE_5754 regulating erythromycin biosynthesis. In this study, RNA-seq was first used to perform the transcriptomic comparison between the parental strain A226 and the ∆SACE_5754 mutant. Overall, 440 genes were up-regulated while 183 genes were down-regulated in ∆SACE_5754, with most of the genes related to the cellular metabolism in S. erythraea. Further, promoter regions of 80 genes with a greater than 0.9 probability in the RNA-seq data were selected by EMSAs to search for SACE_5754’s targets. Our results proved that SACE_5754 directly repressed the expression of SACE_0388, SACE_3599 and SACE_6149 by binding to the palindromic sequence TYMAGG-n2/n4/n11-KKTKRA (Y: C/T, M: A/C, K: T/G, R: A/G). SACE_0388, encoding a pyruvate, water diknase, catalyze pyruvate into phosphoenol-pyruvate, which may enter into TCA cycle. Methylmalonyl-CoA can either be filled or drained by methylmalonyl-CoA mutase-catalyzed reaction converting intermediate succinyl-CoA and methylmalonyl-CoA of TCA cycle in S. erythraea [19, 20]. Coupled with transcriptome data, the expression of several genes involved in TCA cycle (citrate synthase, SACE_0069; fumarate reductase iron-sulfur subunit, SACE_1171; malate dehydrogenase, SACE_3674; methylmalonyl-CoA mutase subunit beta, SACE_5638; methylmalonyl-CoA mutase, SACE_5639; succinyl-CoA synthetase subunit alpha, SACE_6668; succinyl-CoA synthetase subunit beta, SACE_6669; phosphoenolpyruvate carboxykinase, SACE_7274) were analyzed by qRT-PCR. Compared to A226, SACE_1171 was transcriptionally down-regulated by 2.4- folds while the transcription of SACE_7274 was up-regulated by 2.0- folds, and other genes was not transcriptionally regulated by SACE_5754 (Additional file 1: Figure S5). These results suggested that SACE_0388 and SACE_ 7274 may carry more phosphoenol-pyruvate to TCA cycle while SACE_1171 may reduce the flow of succinyl-CoA to succinyl but instead converts to methylmalony-CoA metabolite pool, suggesting a possible way of enhancing erythromycin yield. Considering that SACE_0389, encoding a MarR family transcriptional regulator, was not differentially transcribed upon SACE_5754 inactivation, we did not perform gene inactivation of SACE_0389. SACE_3599 encodes an antibiotic resistance macrolide glycosyltransferase. Glycosyltransferase is an important enzyme that catalyzes the attachment of sugar moieties to acceptor molecules . Deletion of SACE_3599 in A226 didn’t affect erythromycin production, and transcription of SACE_3599 was increased by ~ 4-folds in ∆SACE_5754 relative to that in A226. Recent investigation found that through the regulation of a protein-level modification with overexpression of phosphopantetheinyl transferase genes in 33 Actinomycetes, most of strains displayed novel metabolite profiles . We speculated that that SACE_3599 might be responsible for the biosynthesis of other secondary metabolites, which is worthwhile to do follow-up exploration. SACE_6149, encoding a FAD-binding monooxygenase which has been shown to cover a wide range of different oxygenation reactions , may modify some intermediates in erythromycin synthesis. Detailed insights of SACE_6149 into erythromycin production require further investigation. Based on current results, we propose a pathway of regulation of erythromycin production by SACE_5754 in S. erythraea (Additional file 1: Figure S6). SACE_5754 stimulates erythromycin production by altering the transcription of ery cluster. However, this effect is indirect and SACE_5754’s downstream regulator interacting with promoter regions of ery cluster in S. erythraea remains unknown. Several transcriptional regulators were previously reported to involve in erythromycin biosynthesis in S. erythraea. For example: DasR was required for antibiotic production, pigment biosynthesis, morphological development, chitin and N-acetylglucosamine utilization ; SACE_Lrp is an efficient regulator for transporting and catabolizing branched-chain amino acids ; TFRs were involved in morphological differentiation, propionyl coenzyme A assimilation and erythromycin production [12, 15–17, 25, 26]. Combined with transcriptome data, promoter regions of these transcriptional regulators were selected by EMSAs (Additional file 1: Table S3), and results showed that these transcriptional regulators were not directly regulated by SACE_5754. The direct regulators of ery cluster would be exploring in our studies, for a better understanding of regulatory network of erythromycin production. Manipulating the regulators and their targets is an efficient way to improve antibiotic production in actinomycetes. In an early study, deletion of the Lrp family transcriptional regulator SACE_Lrp in industrial strain WB enhanced the erythromycin production by 19%, while overexpression of its target gene SACE_5387–5386 in deletion of SACE_Lrp of WB increased the Er-A production by 48% . In this study, deletion of SACE_5754 in the industrial strain WB combined with overexpression of its target genes SACE_0388 or SACE_6149 improved Er-A production by 46 and 34%, respectively. When SACE_0388 and SACE_6149 were further co-expressed in WBΔSACE_5754, Er-A production was increased by 64% compared to WB. Our present findings providing a strategy for improved erythromycin production based on engineering of SACE_5754 and its target genes may be applied to the augment of other antibiotic produced by actinomycetes in industry that have SACE_5754 homologs. SACE_5754, a TetR family transcriptional regulator, was identified to negatively regulate erythromycin biosynthesis in S. erythraea. It indirectly repressed the transcription of ery cluster and cannot regulate itself and its adjacent gene. RNA-seq coupled with qRT-PCR, EMSAs and genetic experiments were performed to characterize SACE_5754’s targets associated with erythromycin production. Further engineering of SACE_5754 and its target genes, SACE_0388 and SACE_6149, significantly enhanced erythromycin production relative to its original strain A226. When the combined engineering strategy was carried out in an industrial strain S. erythraea WB, erythromycin production was successively increased by 64% in a flask and by 41% in a fermenter. Our work here presents a new knowledge to understand the regulatory mechanism of erythromycin biosynthesis, and provides a useful strategy to identify and dissect target genes of transcriptional factors for improved erythromycin production. The strains and plasmids used in this work were listed in Additional file 1: Table S1. S. erythraea and its derivatives were grown at 30 °C. Solid R3M medium was used for phenotypic observation and protoplast regeneration . Liquid TSB medium was used for protoplast preparation, seed culture and DNA extraction . The E. coil strain DH5α and BL21 (DE3) were cultured in LB liquid medium or on LB solid plates at 37 °C, used to propagate plasmids for routine cloning and as the host for heterologous protein production, respectively . Gene deletion, complementation, and overexpression in S. erythraea were showed as previously described  . To construct an SACE_5754 deletion mutant, two 1.5-kb DNA fragments flanking SACE_5754 were prepared from the genomic DNA of strain S. erythraea A226 by PCR using the primer pairs 5754-up-F/R and 5754-down-F/R (Additional file 1: Table S2). The two fragments were digested with HindIII/XbaI and KpnI/EcoRI, ligating into the corresponding sites of pUCTSR , generating pUCTSR∆5754. By the homologous recombination with linearized fragments, a 291-bp fragment of the SACE_5754 gene was replaced by thiostrepton resistance gene (tsr) in S. erythraea A226. The desired thiostrepton-resistant mutant, named ∆SACE_5754, was further confirmed by PCR analysis using the primers 5754-C-F/R (Additional file 1: Table S2). For complementation of SACE_5754 in the ∆SACE_5754 and SACE_5754 overexpression in A226, a 624-bp DNA fragment containing a full-length SACE_5754 was amplified by PCR with the genomic DNA of A226 as a template. The PCR product was cleaved with NdeI/XbaI, and inserted into the corresponding sites of integrative expression plasmid pIB139 , yielding pIB139–5754. By PEG-mediated protoplast transformation, pIB139–5754 was introduced into the ∆SACE_5754 mutant and the parental strain A226, respectively. The complemented strain ∆SACE_5754/pIB139–5754 and overexpression strain A226/pIB139–5754 were obtained by apramycin resistance screening and confirmed by PCR analysis with primers Apr-F/R. In accord with above procedures, we constructed SACE_0388 deletion mutant ∆SACE_0388, complemented of SACE_0388 in the ∆SACE_0388 (∆SACE_0388/pIB139–0388), SACE_0388 overexpression in A226 (A226/pIB139–0388), SACE_3599 deletion mutant ∆SACE_3599, SACE_6149 deletion mutant ∆SACE_6149, complemented of SACE_6149 in the ∆SACE_6149 (∆SACE_6149/pIB139–6149) and SACE_6149 overexpression in A226 (A226/pIB139–6149). All primers used in this work were listed in Additional file 1: Table S2. For SACE_0388 and SACE_6149 overexpression in the ∆SACE_5754, pIB139–0388 and pIB139–6149 were introduced into ∆SACE_5754 strain to obtain ∆SACE_5754/pIB139–0388 and ∆SACE_5754/pIB139–6149 by PEG-mediated protoplast transformation, respectively. For co-expression of SACE_0388 and SACE_6149 in WB∆SACE_5754, the combined DNA fragment containing PermE* and SACE_6149 from the pIB139–6149 was amplified using the primer pair ermE-F and 6149-C-R. The PCR product was digested with NotI/EcoRV, ligating into the corresponding sites of pIB1390388 to generate pIB139–0388-6149. By PEG-mediated protoplast transformation, pIB139–0388-6149 was introduced into the WB∆SACE_5754. The co-expression SACE_0388 and SACE_6149 in the WB∆SACE_5754 strain WB∆SACE_5754/pIB139–0388-6149 was obtained by apramycin resistance screening and confirmed by PCR analysis with primers Apr-F/R. The SACE_5754 coding region of 207 amino acids was obtained by PCR using the primers 5754-22b-F and 5754-22b-R (Additional file 1: Table S2). The PCR production was cut with EcoRI/HindIII and cloned into pET22b generating a C-terminal His-tag fusion. The constructed plasmid pET22b-5754 was introduced into E. coli BL21 (DE3), and SACE_5754 expression was induced by 0.5 mM IPTG at 20 °C for18–20 h. The recombinant His6-tagged SACE_5754 was extracted and purified on Ni2+-NTA spin column (Bio-RAD). The quality of the purified protein was estimated by polyacrylamide gel electrophoresis (SDS-PAGE). The purified protein was stored at 4 °C and used for electrophoretic mobility shift assays (EMSAs) and DNase I footprinting assays. The EMSAs were performed in the light of previously reported methods . DNA probes were amplified by PCR using the primers listed in Additional file 1: Table S2, and were incubated individually with various concentrations of His6-tagged SACE_5754 in binding-buffer (10 mM Tris (pH 7.5), 5 mM MgCl2, 60 mM KCl, 10 mM DTT, 50 mM EDTA and 10% glycerol) at 30 °C for 10 min in 20 μL reaction mixture. After incubation, the samples were fractionated on 6% native PAGE gels in 1× TAE buffer at 80 mA for 35–45 min. An FAM fluorescence labeling capillary electrophoresis method was used for DNase I footprinting . To identify the binding site of the SACE_5754 protein in the P0388–0389 (the entire SACE_0388-SACE_0389 intergenic region), P3599 (the entire SACE_3599 intergenic region) and P6148–6149 (the entire SACE_6148-SACE_6149 intergenic region), a 261-bp 6-carboxyfluorescein (FAM), a 218-bp 6-carboxyfluorescein (FAM) and a 143-bp 6-carboxyfluorescein (FAM) fluorescence-labeled DNA fragment were amplified by PCR using primers FAM-P0388–0389-F/R, FAM-P3599-F/R and FAM-P6148–6149-F/R (Additional file 1: Table S2), respectively. The labeled DNA fragment (150 ng) and corresponding concentrations of His6-tagged SACE_5754 protein were added to a reaction mixture (final volume 50 μL), and incubated at 30 °C for 10 min in binding buffer. DNase I (1 U/μg; Promega) treatments with various concentrations were performed for 60 s at 25 °C, and terminated by addition of DNase I Stop Solution and heating for 10 min at 65 °C to inactivate the DNase I. DNA samples were analyzed with a 3730 XL DNA Genetic Analyzer (Applied Biosystems) after purification, and data analyses were performed using GeneMarker software program v2.2. Total RNA was isolated, using the TransZol up (Transgen, China), from cultures of S. erythraea A226 and ∆SACE_5754 grown in R5 liquid medium after 2 days. The quality and quantity of RNAs were examined using a microplate reader (BioTek) and confirmed by electrophoresis. The transcription levels of various genes were determined by quantitative real-time PCR analysis as described previously  using the primers listed in Additional file 1: Table S2. qRT-PCR was performed on the Applied Biosystems QuantStudio 6 Flex system with Maxima™ SYBR Green/ROX qPCR Master Mix (MBI Fermentas). The hrdB (SACE_1801) gene was used as the internal control, and relative transcription was quantified using a comparative cycle threshold method . For flask fermentation of S. erythraea and its derivatives, spores were inoculated into 50 ml of TSB seed medium and grown for 2 days. Then, 5 ml seed culture was transferred into 50 ml R5 liquid medium and all fermentation cultures were grown at 220 rpm, 30 °C for 6 days . For bioreactor cultures, S. erythraea WB and its derivatives were cultivated in the industrial medium with a 5-L fermenter (Baoxing, Shanghai, China). Samples (50 ml) were taken every 24 h. Erythromycin was extracted in fermentation culture of the S. erythraea strains as described previously . An Agilent Extend-C18 column (5 μm; 250 × 4.6 mm) was equipped in the Waters Breeze HPLC and was equilibrated with 60% solution A (5 mM ammonia acetate, pH 7.0) and 40% solution B (acetonitrile). An isocratic program was performed at a flow rate of 1.0 mL/min at 25 °C using 2424 ELSD detector. Total RNA was isolated, using the TransZol up (Transgen, China), from cultures of S. erythraea A226 and ∆SACE_5754 grown in R5 liquid medium after 2 days. The quality and quantity of RNAs were examined using a microplate reader (BioTek) and confirmed by electrophoresis. RNA samples of A226 and ∆SACE_5754 were used for RNA sequencing. Library construction and sequencing were performed using Illumina Hiseq™ 2000 at The Beijing Genomics Institution (BGI, Shenzhen, China).The data obtained from the sequencing of the Illumina HiSeq ™ 2000 is called raw reads or raw data, and then the raw reads were subjected to quality control (QC)-controlled to determine if a resequencing step is needed. After raw reads are filtered, the clean reads were aligned to the reference sequence . The original sequence data have been submitted to the database of NCBI Sequence Read Archive (https://www.ncbi.nlm.nih.gov/sra/SRP129064) under the accession number SRP129064. For gene expression analysis, the matched reads were calculated and then normalized to probability using Noiseq package method . The significance of the differential expression of genes was defined by bioioformatics service of BGI according to the combination of the absolute criteria of Foldchange ≥2 and probability ≥0.8. To validate the RNA-seq results, 28 genes annotated with biological functions and the probability from high to low were analyzed by qRT-PCR. Our qRT-PCR measurements for these genes showed similar trends of expression changes estimated from the RNA-seq data (Additional file 1: Figure S7). All data in this study were stated as means ± standard error of mean (SEM), and analysis by Student’s t-test, with *p < 0.05, ** p < 0.01 and ***p < 0.001, ns, no significant. Hang Wu and Zuling Chu contributed equally to this work. This work was supported by the National Natural Science Foundation of China (31300081, 31570074 and 31600064), the National Program on Key Basic Research Project (973 programs, 2013CB734000), Open Fund for Discipline Construction from Institute of Physical Science and Information Technology at Anhui University, and Anhui Provincial Natural Science Foundation (1708085QC49). The original RNA-seq data have been submitted to the database of NCBI Sequence Read Archive (https://www.ncbi.nlm.nih.gov/sra/SRP129064) under the accession number SRP129064. BZ and LZ supervised this study. BZ, LZ, HW and ZC conceived of the study, involved in study design, data interpretation and drafted the manuscript. HW, ZC, CZ, WZ, JN, HF and YC performed the experiments and data analysis. All authors read and approved the final manuscript.